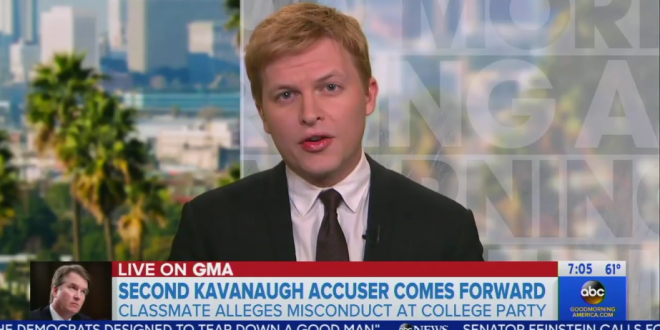 Ronan Farrow: Kavanaugh's Second Accuser Only Came Forward When Dems Learned About Her Story [VIDEO] - Joe.My.God. The second woman to accuse Supreme Court nominee Brett Kavanaugh of sexual misconduct came forward only after Senate Democrats independently learned of the alleged incident involving her and Kavanaugh in college, according to one of The New Yorker reporters who investigated her allegation. Reporter Ronan Farrow, who investigated Ramirez’s claims with New Yorker colleague Jane Mayer, told ABC News Chief Anchor George Stephanopoulos on “Good Morning America” Monday that Ramirez chose to come forward after Senate Democrats “began looking” at the alleged incident.